So Spring Break has sprung and we are making the best of it. Why please tell me why the weather will be beautiful and then a break comes or the weekend comes and guess what... it rains. It has rained since Friday. I am very much OVER the rain... really where is the SUN? So enough of that and onto our adventures. We are having fun and living the hotel life in the big city of Atlanta. 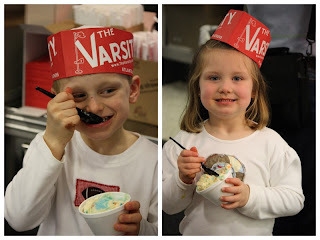 Enjoy the pictures of our fun! How many of you remember as a child that an indoor pool was the coolest thing ever. 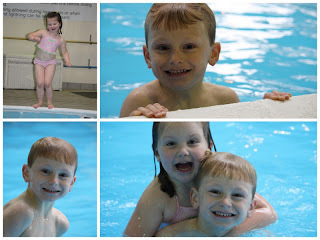 Surely I was not the only one... it did not matter if we stayed in a hotel 10 minutes from our house if it had an indoor pool we were on "vacation" and I thought I have died and gone to heaven... and my kids are no different. Another hot spot we took the kids to eat while here was The Varsity. What more can you ask for hamburgers, hot dogs, fries, onion rings, ice cream, a hour on the treadmill, oh yeah that was not on the menu but it should be. So here they are enjoying their "birfday cake" ice cream. 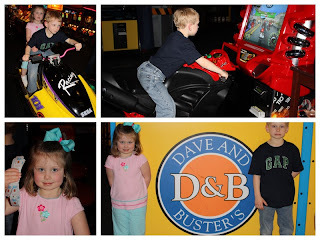 We also hit another favorite place... Dave and Busters. We will never get them back in Chuck E Cheese... they thought this place was the coolest ever! They loved "riding" all the ride games and winning all the tickets and "shopping" at the "junk counter". Fun times. Oh the joys of being a kid. And something totally unrelated to Spring Break... and maybe just a little proud of myself for figuring this out. I can brag right b/c it is my blog right??? So I got the Cannon Rebel for Christmas and I love taking pictures with it but I will be the first to admit that, the camera can do WAY more than I understand and sure I could read the manual cover to cover but to be honest I don't really want to... so while the kiddies were swimming in the indoor pool and daddy was doing daddy duty in the pool (b/c mommy doesn't... a) get in a bathing suit in march with no tan or b) basically get in a bathing suit unless i am basking in the sun... anyone else feel that pool duty is daddy duty too?) I was "playing" with my camera. 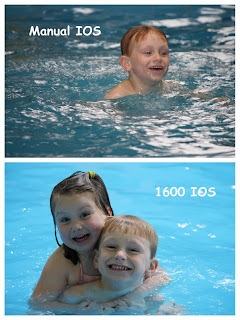 I saw this IOS button on top and started playing with it... it was way cool to figure out that 1600 IOS took really cool indoor pool pictures as apposed to manual IOS. I basically figured out that is has something to do with the amount of light it lets in (i think) so I am sharing the difference a little IOS makes in your pics. And if you have this camera feel free to share any other tricks you might know?? I am always up for options.